What’s the Project? 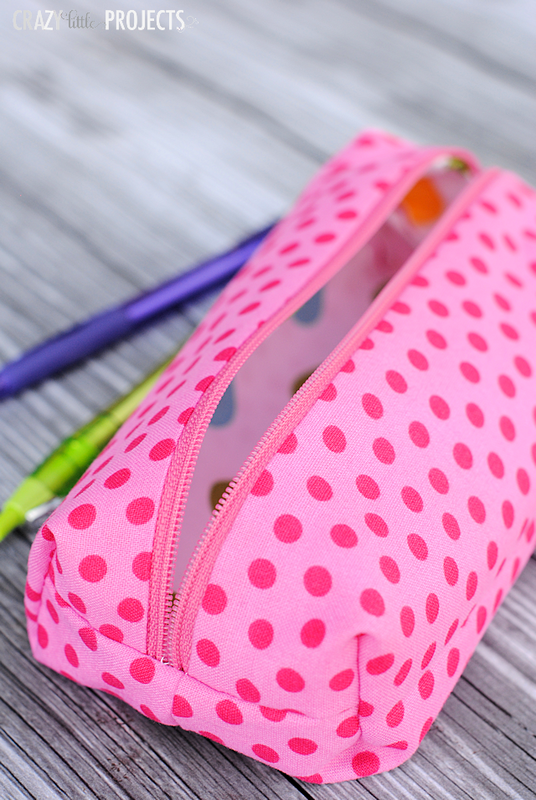 Your kids will love it when you use this cute pencil case pattern to make them a fun pencil pouch for their school supplies. 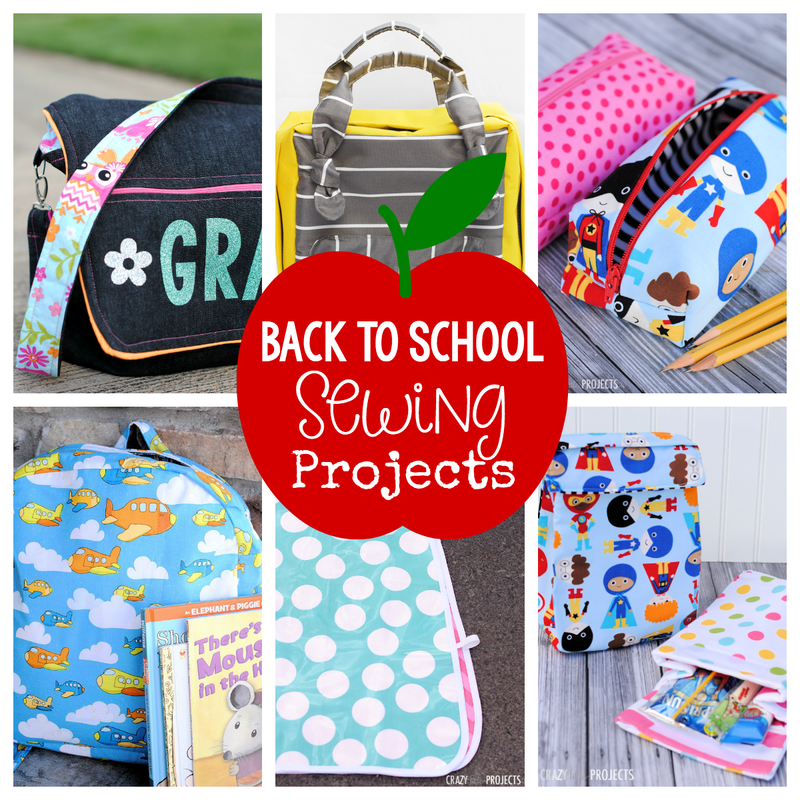 An easy sewing pattern to follow and it works great for kids of all ages! Well, the sad day has come, and for us Back to School has happened. I guess I can console myself with the thought that with 3 out of 4 in school and the little guy doing preschool I will have more time for projects! For my first afternoon with the kids at school, I sewed up one more back to school project. I’ve got a major thing for school supplies, so this was fun. 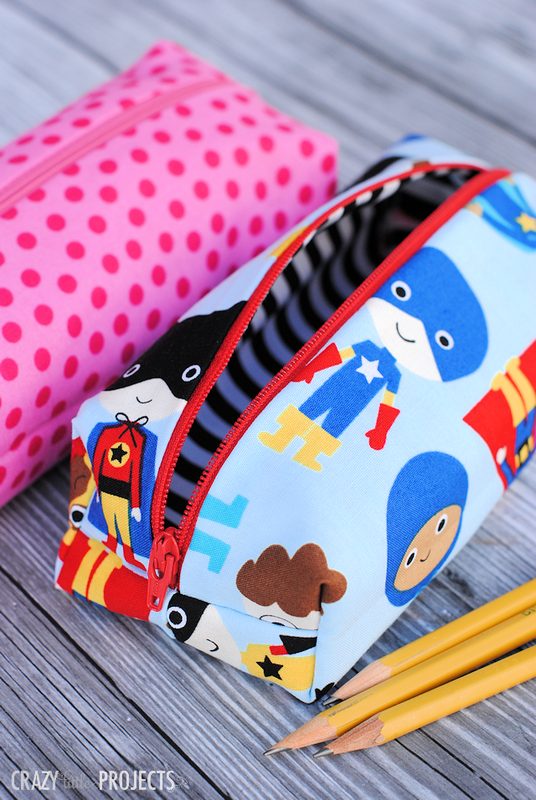 It’s a pencil case pattern that fits all your pencils, pens and even scissors or other supplies. 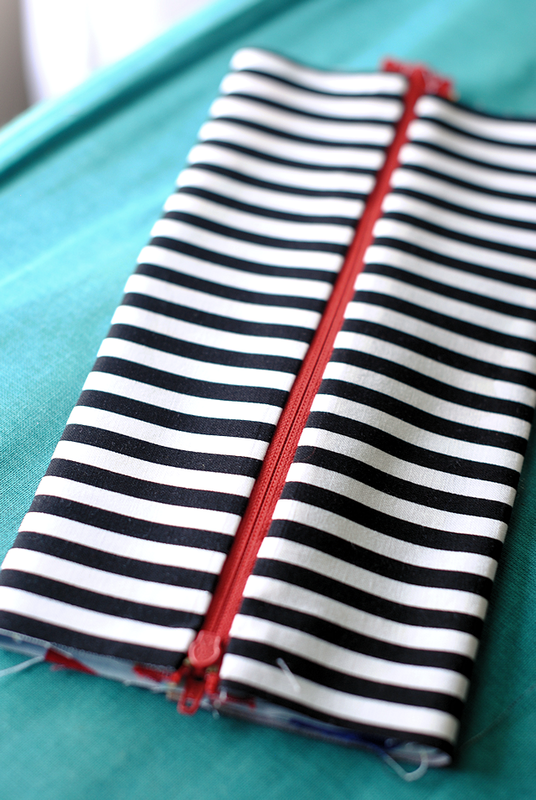 It’s a pretty quick project and it’s one of the easiest ways to sew a zipper, so if zippers scare you, try this! I think it’s so cute I might need one of these for myself! Stitch along that zipper edge. When you get close to where the zipper pull is, stop sewing, knot your thread and move the zipper pull out of your way by unzipping it. Then continue sewing to the end. Sew again along the zipper (but on the other side this time). Unzip the zipper halfway. Sew each of the short ends. You will sew through the ends of the zipper. Just make sure that it is pulled together as you sew through it. Do this on all 4 corners, making sure that you keep them each even. Pull it all right side out and you’ve got a fun little pencil bag! That’s it! 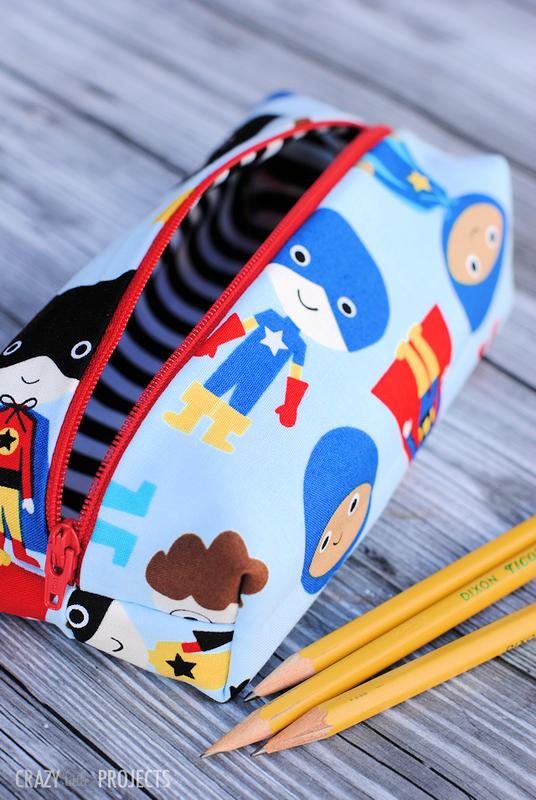 I hope you love sewing this cute pencil case pattern! Do you know if the old Cricut can cut fabric too? At the very least I am sure it can cut the heat transfer vinyl right? Love your blog and projects :) Thank you for all the inspiration! I’m not sure but I don’t think so? Yes, the old circuits can cut fabric. I do it all the time. There are tutorials on you tube. So cool! I’ll be knocking a few of these out for sure. These are so fun! I cut Burlap yesterday and learned some of the same stuff. I ironed on Freezer Paper and it cut like a charm! Thanks lady! Oh that is Really good to know!!! What a great project to organize the little ones! So cute! Just bought my Cricut Explore this week. Haven’t had a chance to open the box, but I love reading your article. Great ideas. 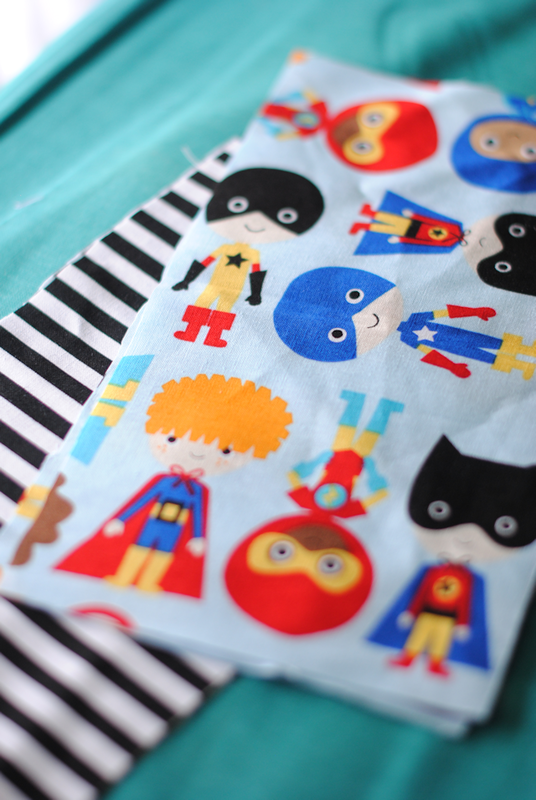 Can you tell me where I can get the Super Hero fabric? 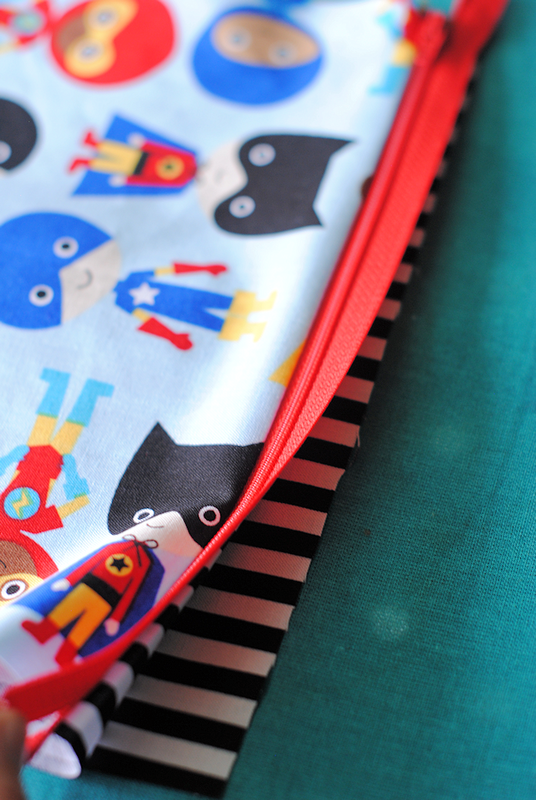 Hi…could you let me know if the finished pencil bag has the seams hidden or you see them on the inside of the pencil case..thankyou. Hi there, is there a way of doing the box corners, but having the seams hidden in between the layers of fabric? 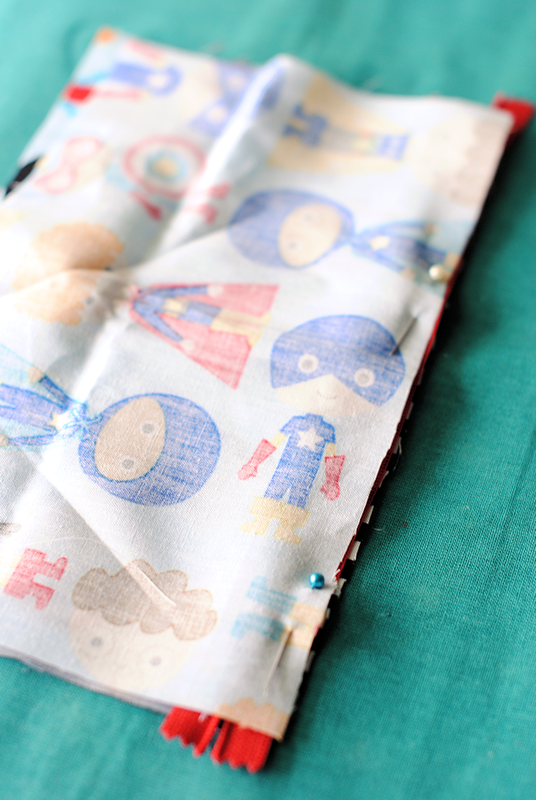 I figured out how hide the long bottom seam but hiding the corners is more tricky, help plse……..
Not if you are using just one layer of fabric. But if you are doing two like on this, then the raw edges get hidden between the two layers on the end. Does that make sense? Thank you the tips on cutting fabric , now ill be able to make excellant Christmas gifts!!! I’m really confused about the box corners, I cannot figure it out from the picture. which part am I supposed to form a triangle from? can you do step by step pictures of this phase? What kind of fabric would you recommend for this project? It’s in the way you put the two together and turn it all right side out. The seams end up inside. Thank you so much for this tutorial. I just made a couple of matching ones (his and hers) for my daughter and her boyfriend and they love it! I made the pencil box and it was cute, but standard pencil was too long and would not fit. making another a little longer and matching tote for my granddaughter for Valentines Day.Its possible my practice one was with was material too thick because I used less than 1/2 inch seam allowance.Not sure what the problem was, but will try again. Hmmm, that’s odd. I’ve definitely put pencils in mine, but that’s good feedback! Unsharpened pencils would only fit in mine if they were put in diagonally, and I didn’t do the box corners. Next time I will make it a fair bit longer. I did French seams at 1/4″ so I don’t *think* that would have affected the length very much. I couldn’t fit pencils in mine either. 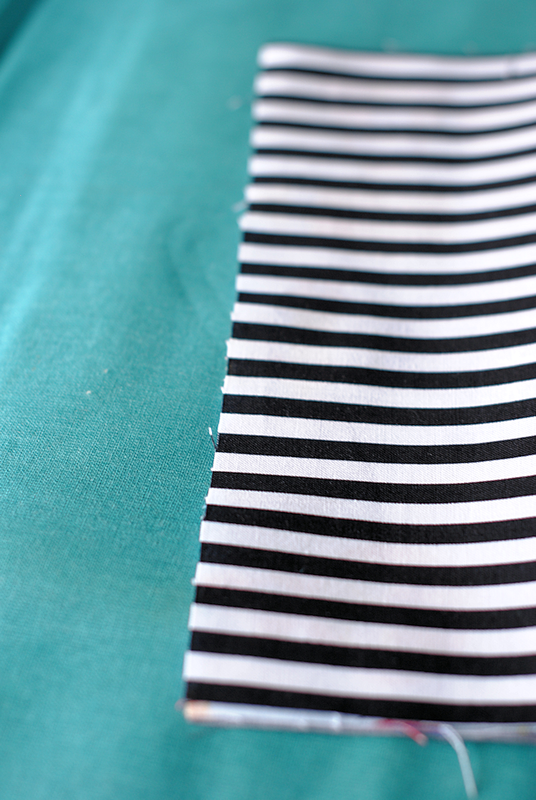 I took a 1 cm seam allowance, which is slightly less than the recommended half inch. My son is really disappointed! Thank you so much for the tutorial. I love the fabrics you picked out. I love your Blog! Congrats for all your inspiration ! That spreads wherever it arrives, until here in Brazil ! You are so kind when you show us your ideas and tips ! Nice tutorial. For the box corner what should be the length of the line on which we stitch? Probably just about an inch or so. 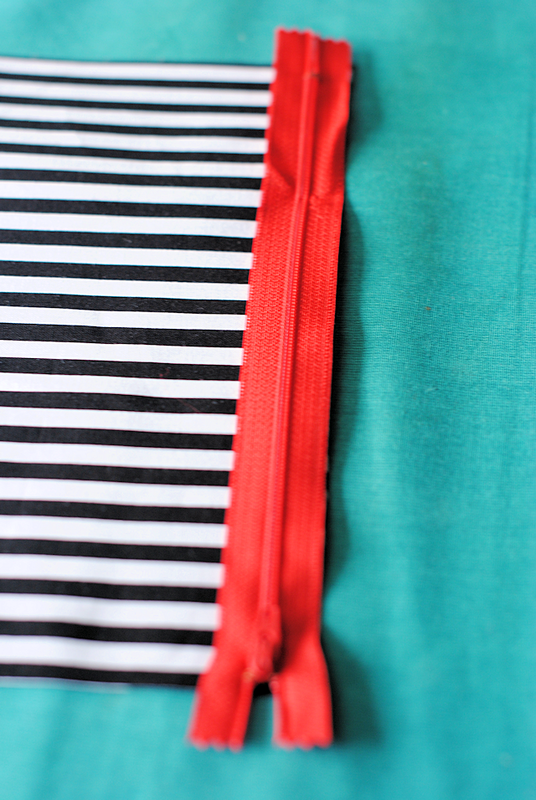 On the second part of sewing the zipper, does the top of the zipper(zipper pull) face down? Just made one of these! Tutorial was very helpful, only a little bit of confusion when I was sewing the short ends and had to move the zip. Didn’t understand why at first but then it made sense after the fact. If I wanted to include a small loop, or even a wrist-type strap, would I just put that in the vertical seam maybe an inch below the zipper? Thank you for this great tutorial! Just made 7 in all different fabrics for my daughters party favors. They turned out super cute. I added little ribbon tabs on both ends so it gave you something to hold on to when opening and closing. So happy with how they turned out. Thanks again. Love hearing this! Sounds like they are cute! I tried a french seam, and it hides the seam on the bottom very well. 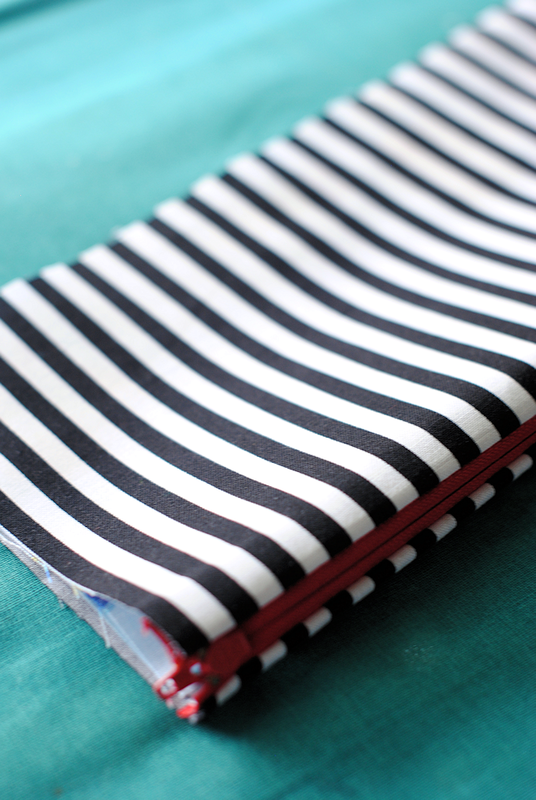 The corners can’t be helped, but they can be zigzagged once box-ends are sewn and trimmed. Hope this helps. This is a great tutorial! I love any excuse to get out my Cricut Explore Air Cutting Machine! I love the idea above to use these as the party favors for the end of my daughter’s birthday party! Can’t wait to go shopping for some cute material! Thanks! I just made this as a Valentine’s gift for my child’s kindergarten teacher for her class rooms utensils, it is adorable. I made it 10.5″ x 6″ to fit markers or even a pack of tissues etc. It is really really the cutest little gift. Filling it with Valentine’s chocolates for teacher! Ps: when I boxed my corners, I measured each corner to sew at 2cm. from the point if that helps anyone. Directions are exact! Thanks so much for sharing! This was my first sewing project ever ! I tried making something from scratch for thefirst time and this is easy enough (even though I did feel overwhelmed at times as I managed to break two sewing needles on this one, but this is to blame on my very old very unreliable sewing machine and, well, my complete lack of experience). Anyway, thanks for the great tutorial, I’ll be making another one for sure! 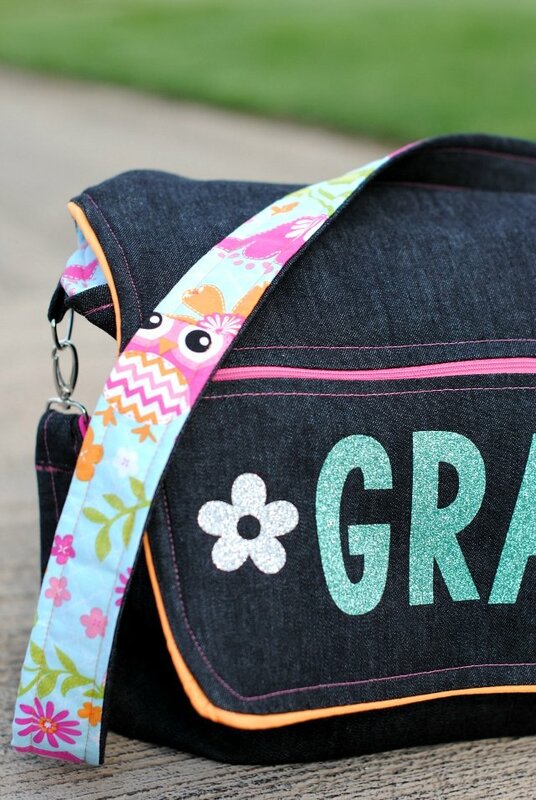 Congrats on sewing your first project! It will get easier each time! Just made this. Thanks for the tutorial. I have made other pencil cases before, so I used the zipper foot and also top stitched near the zip too. I’m not sure if I messed it up or if the seams inside are supposed to be exposed? Judging from the comments, other people had the same issue. 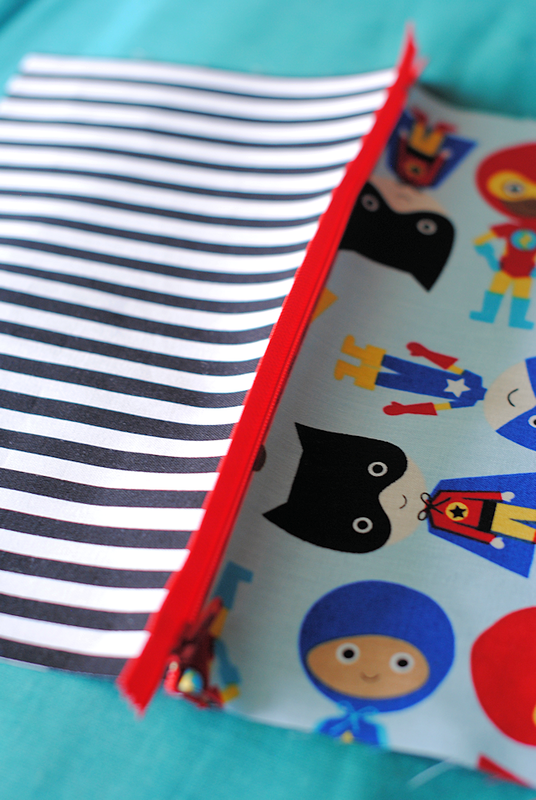 I thought it would be like the other cases I’ve made, where you turn it inside out and then all the seams are hidden. That was a little disappointing. I did trim them with my zigzag scissors, so I hope it holds up ok, since it’s for my son for school. 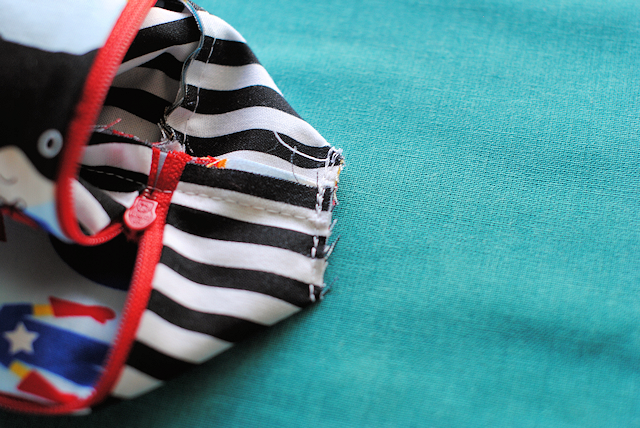 If I make it again, I would just fold the main inside seam, so it was hidden. That would be easy enough to do. Hi I just made one too. The instructions were great. I made mine a little larger, with 11.5 inch length of zipper edge for some special pens but after the box corners it is not long enough. I ended up with a length of just over 8 inches. It would be helpful for you to publish the finished size of the bag. But no worries really, as I’m looking forward to making another one. And I did turn the two main panels so the bottom seam is hidden as others commented. It is very easy to sew outer side to outer side; then inner side to inner side, press seams and then turn them right sides out like a sleeve.